We all need a healthy dose of inspiration from time to time. By looking up to great thinkers and trying to get a glimpse of their personal life, we want to see what they do differently and figure out what could be our own key to success. Research has shown that people in messy rooms are quicker at solving creative problems than those in tidy rooms. But our common sense seems to argue exactly the opposite — if someone fails to clean up the clutter from his desk, can he keep his mind sharp and focused? Many famous inventors and pioneers differed in their view on the orderliness. So why don’t we take a closer look at their workspaces to discover the peculiarities of some of the greatest thought leaders in history? Let’s see what their offices and desks can tell us! This visionary mind has turned the world of computers upside down. 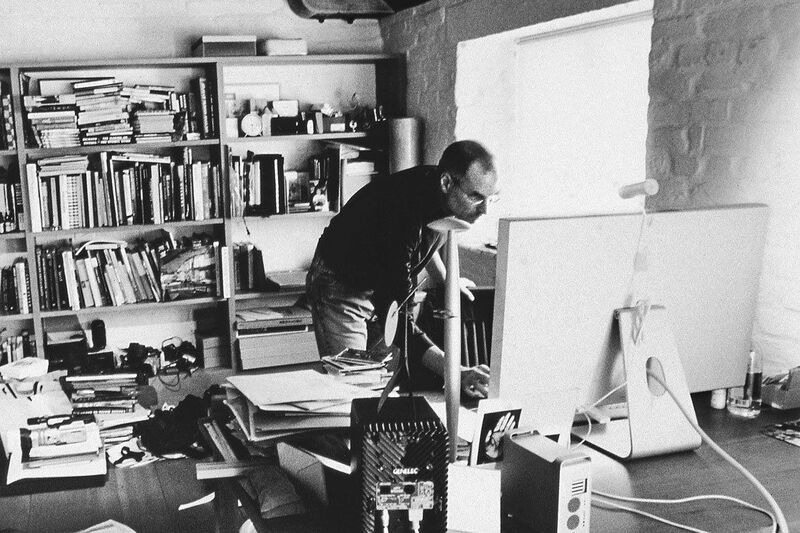 But only few people know that Jobs was living a single and simple life when he was starting to work on the first Macintosh computer. 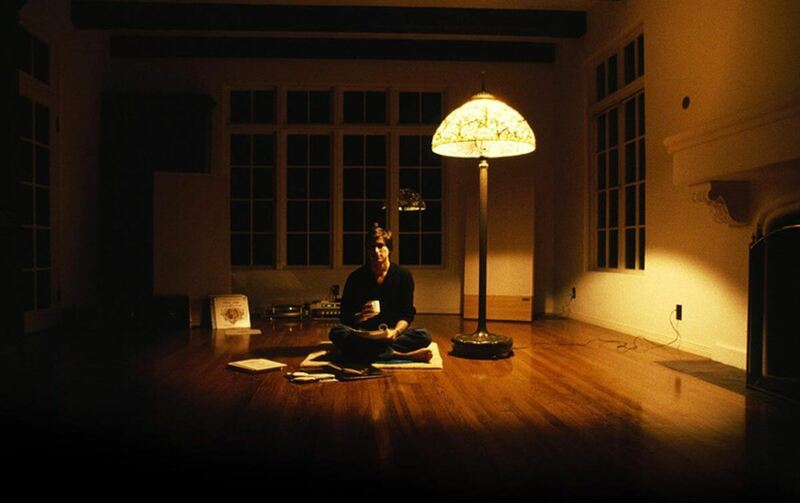 This period of his life was instrumental for determining the characteristic simplicity of all Apple products. 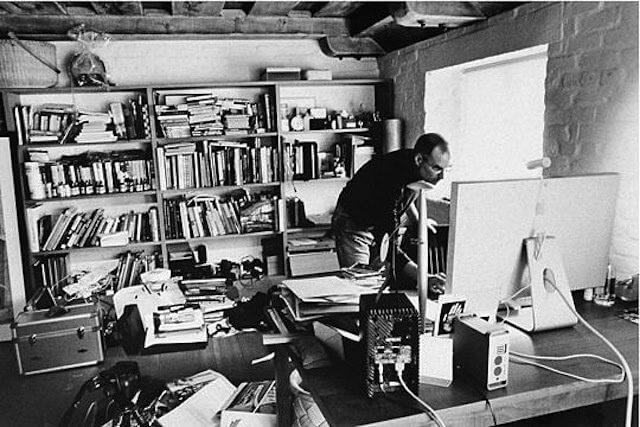 Bringing it more up-to-date, Steve Jobs workplace was, ironically, one big mess. Succeeding in decluttering our desks more than any other product designer, Jobs seemed to be quite happy to wallow in a bit of chaos. Tesla’s making history and its mastermind leaves nothing to chance (see this to learn how to get a job there). When the new Model X went into production, Elon Musk made a decision to move his desk to the end of the production line. Spending hundreds of hours a week at work, no wonder he brought a sleeping bag to his office and put it right next to his desk. 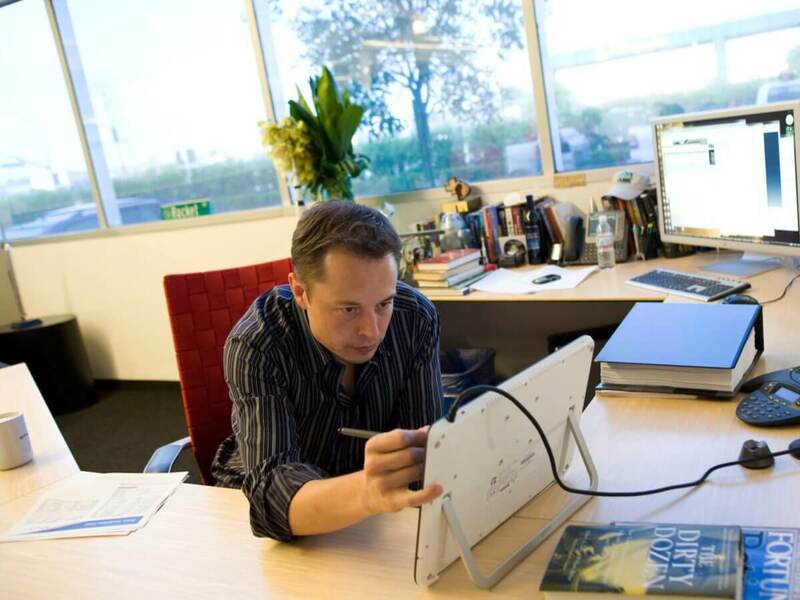 On the other hand, Musk’s desk at SpaceX looks fairly ordinary (check this to see how to get a job there). It reflects his highly disciplined work schedule which is broken up into 5-minutes-long blocks of intense work. So instead of procrastinating and cluttering his workspace with memorabilia of the past, his mind is focused on the future. The way you think about work environment communicates your values to the outside world. 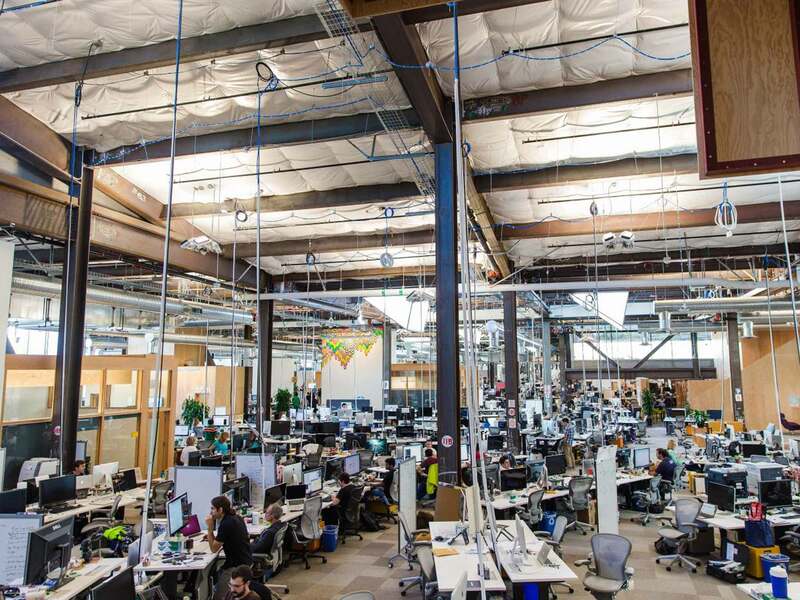 The setup of the new Facebook’s headquarters reflects Mark Zuckerberg’s belief that an open floor plan where people work close to each other enables better communication and collaboration among employees. If you just fell in love with the idea, here’s a detailed guide how to get a job at Facebook. Consistent with his normcore fashion style, Facebook’s CEO also keeps his workspace simple. In his live video tour of Facebook’s new headquarters, Zuckerberg explains that he doesn’t have an office for himself. 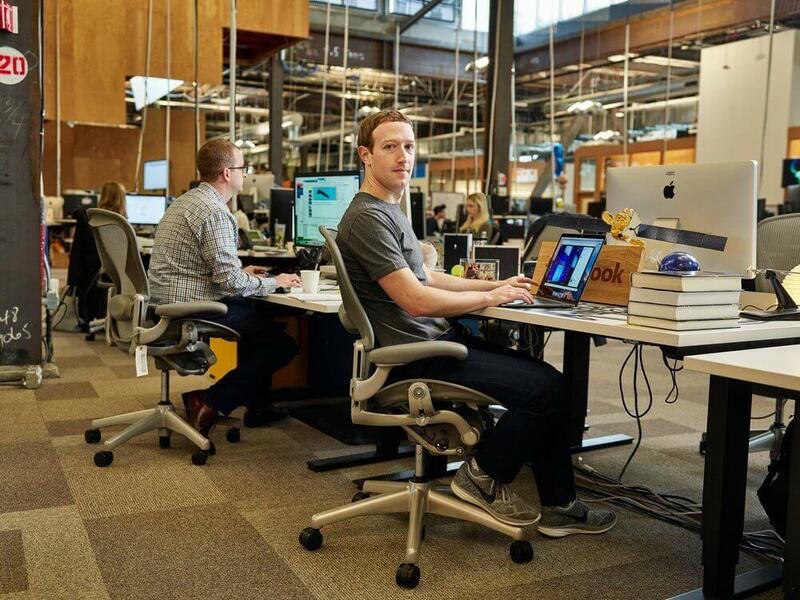 Instead, he works from the same kind of desk as every other Facebook employee. There are just few things on Zuck’s desk. A laptop, a pile of books from his Year of Books challenge, and a model of the company’s visionary project — a satellite that Facebook’s working on at the moment to spread the Internet to all corners of the world. Good luck! The genius physicist is one of the greatest minds of the 20th century and greatest advocates of a messy desk at the same time. 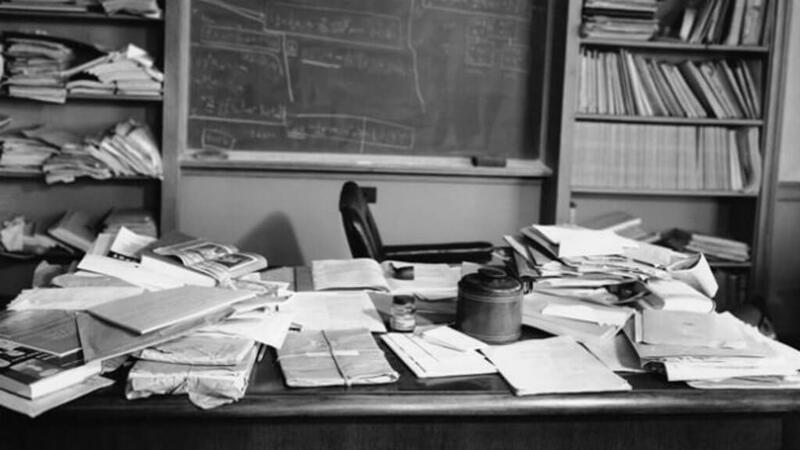 According to Einstein, a messy desk is a productive desk. Creative minds tend to be a bit light on the housework and he considered that completely normal. Einstein’s iconic desk is untouched and left exactly as it was on the day he died in 1955. Books and sheets of paper everywhere and a blackboard full of notes behind his back. Fairly impressive. This surreal photograph of a supercharged magnifying transmitter was shot in 1899 and immediately entered history. It was taken inside Tesla’s lab in Colorado Springs but its sensational appearance is a result of smart editing that we now call ‘post-production’. Tesla knew too well that to sit there would be to lose his life. The photo was taken by Dickenson V. Alley as part of a promotional stunt. 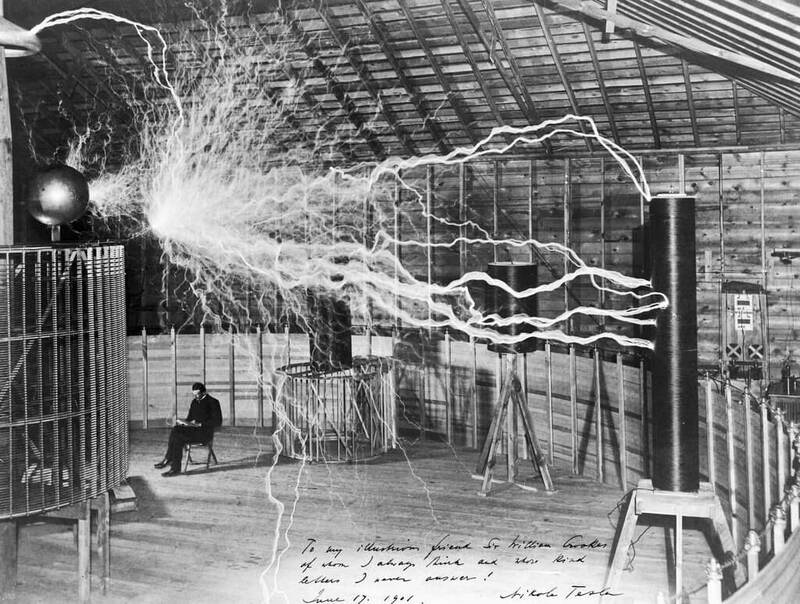 The inclusion of Tesla hanging out in his chair was possible only through double exposure. To create the photo, Alley took two photos and merged them together. He first photographed the machine’s massive sparks in a darkened room. Only after the machine was off could he invite Tesla to pose in the chair for the second photo. No worries, Tesla was no liar and admitted that the photo was ‘photoshopped’ soon afterwards. But its fame spread in the speed of light. Great piece of marketing, Nikola! Just look at this incomprehensible (at least to us!) 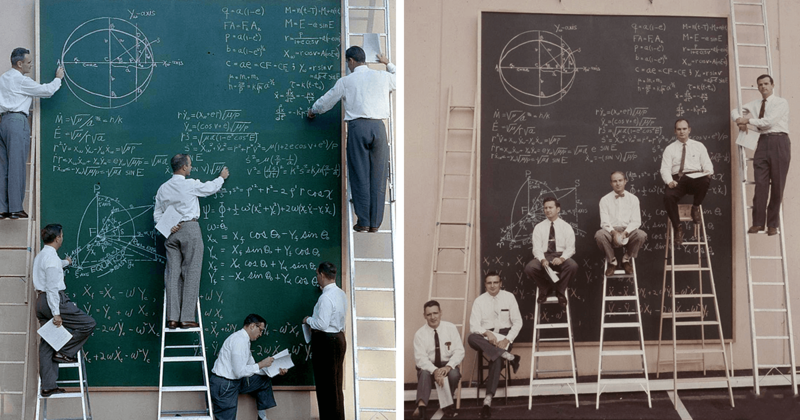 board of calculations being occupied by elite NASA scientists in 1961. This is how they did it the old school way. The age before computers. Nope, not even calculators existed back then. The photo, taken by J. R. Eyerman for LIFE magazine, does indeed look very scientific and impressive. But as a mathematician would point out, there are just a couple of general equations of motion and no calculations on the board. The scene was certainly staged, but why didn’t they use some real badass math? Back in the Space Race era, NASA would be a fool to publish anything other than generic equations in LIFE magazine. 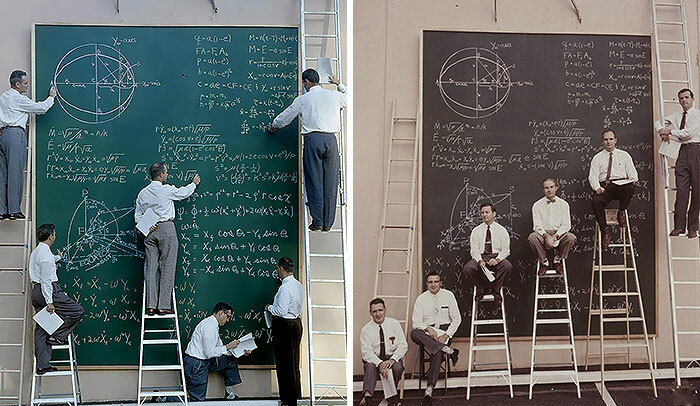 But the situation in the photo might actually resemble what the scientists’ work used to look like — just with more constructive things written on the board. One of the things NASA was known for were so-called ‘math parties’ where prominent scientists would gather and each of them would master one part of the equation. So geeky! 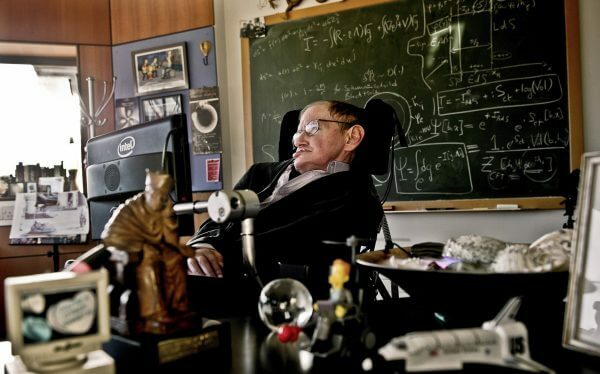 This shot captures the desk of the late theoretical physicist at the University of Cambridge back in 2012. The photo was commissioned as a photographic portrait to celebrate Stephen Hawking’s 70th birthday. However, this isn’t exactly how Hawking would normally arrange his things. Various items and oddities that he had in his office were moved into view. This was done in order to give you a glimpse inside one the greatest minds of modern science. Take the plastic action figure with the helicopter top, for example. It’s Hawking as he appeared in an episode of The Simpsons. Other curiosities include a statue of the pope, a little toy computer with sticky notes, a space shuttle model. 8. Mr Edison, it’s time to wake up! The photo shows the prolific inventor and businessman dictating instructions to an employee on his dictating machine in 1929. Though best known for his invention of the phonograph and incandescent electric light, Edison had 1,093 US patents in his names in a variety of fields. But not many people know Edison was also a renowned catnapper. While looking pretty busy at his desk, he was likely to doze off on various pieces of furniture in his lab. 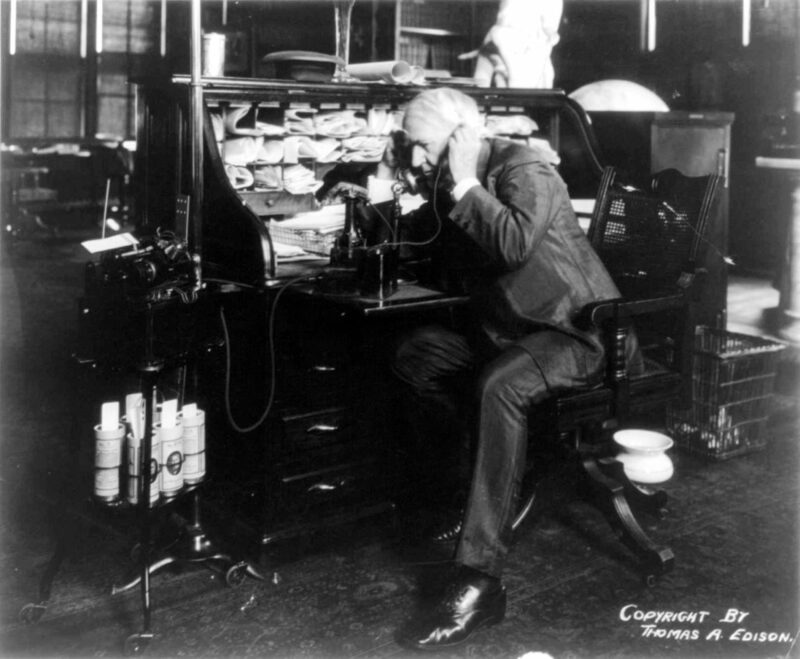 Thomas Edison’s desk was full of cubbyholes — small holding places for the stream of ideas in his mind for future inventions and current business. The piles of papers and projects around him were only a reflection of the ever-expanding questions in his mind. 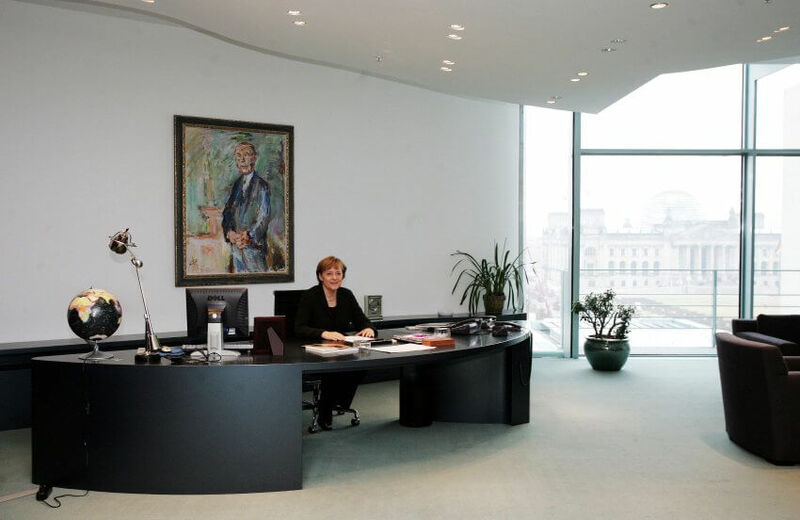 Rarely giving any interviews and sleeping only 4 hours a day, Merkel may seem like a recluse. But serving as Chancellor of Germany since 2005, she is the de facto leader of European Union and, and as many would claim, the most powerful woman in the world! But still there’s still something peculiar Merkel needs to deal with every single time she comes to work. It’s her desk. By the way, guess who’s the man looking constantly over Merkel’s shoulder. Nope, that’s not her husband. It’s a rather cool portrait of Konrad Adenauer, West Germany’s first post-war leader. And what about that desktop world globe? Undoubtedly, there’s just one way to read it — as a symbol of Chancellor’s motherly concern for each and every country on the planet. Natürlich! We have gone to great lengths looking for someone who’d challenge Albert Einstein’s rhetorical question about an empty desk. The following picture shows if not one of the greatest, then one of the most influential minds of the 21st century. 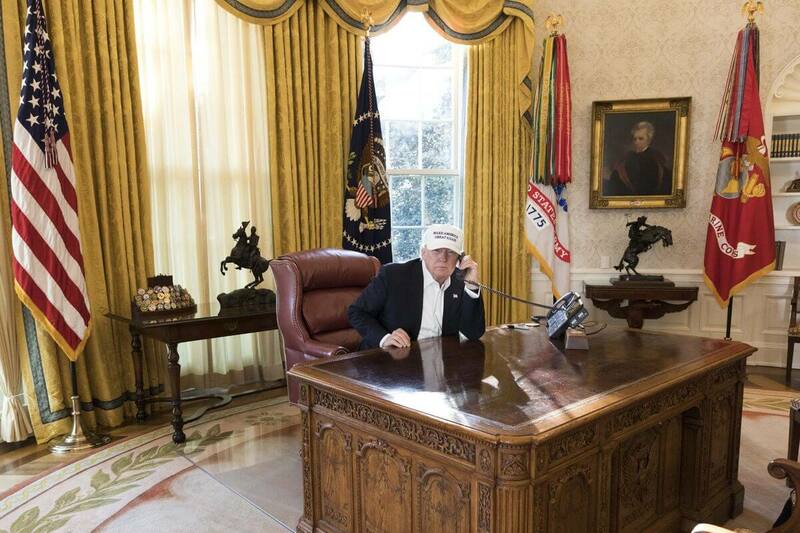 Donald Trump’s shiny Oval Office desktop tries hard to convince us his mind is far from cluttered. In fact, there’s nothing on the famous Resolute desk but a telephone, a coaster, a black marker and a wooden box. But where is the red nuclear button, so much bigger than Kim Jong-un’s? No one knows, and we all hope the president doesn’t either. Some people feel better sitting behind a clean and tidy desk. Others like to be surrounded by huge piles of books and documents. Whatever the preferred setup, it always seems to reflect the mindset and current pursuits of a given person. Workspace design is a matter of choice that should suit your ways of working. Through all the activities we have during the day, our desk is where we store our most important documents and tools and where we get most of our work done. Leave nothing to chance and arrange your desk the way you like it. Keep useful items at hand and get rid of all unnecessary stuff occupying your workplace. Get ready for the flow of new ideas and watch your personal success story unfold. Searching for a new workplace? 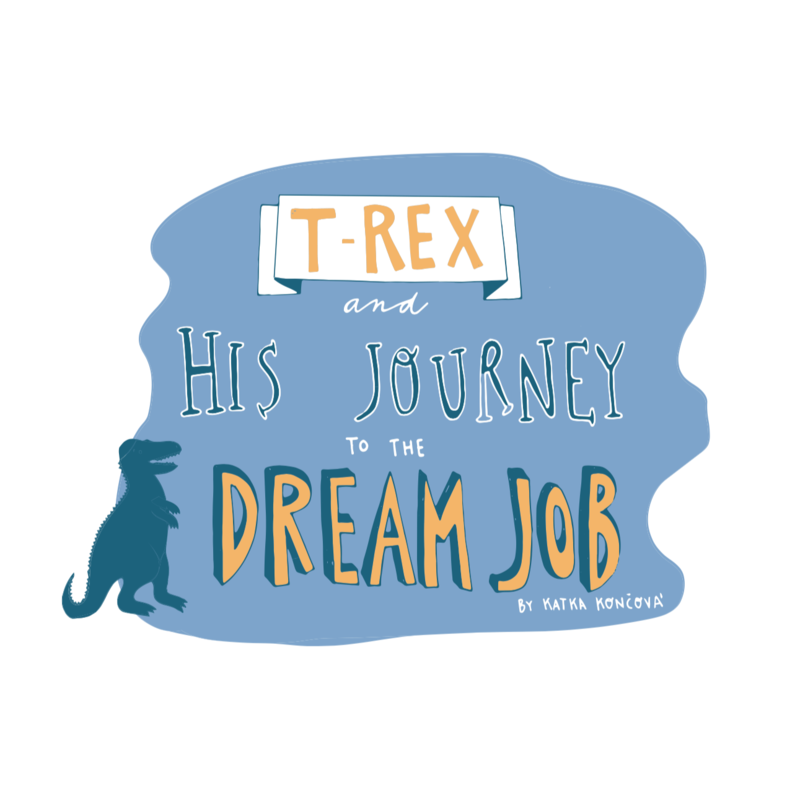 Clean up your desk and check out The Jobseeker’s Guide To the Galaxy — our ultimate guide to job hunting.